Sixteen teams from around the Bay Area signed up to bowl in the Glenn Stewart (formerly called the Ed Arnold) tournament in Palo Alto today, and our club was well represented by 18 full and dual members. This tournament is unique because all bowlers play each position (lead, second and skip) for four ends. Team Shawn Roney, Ann Brillhart and Cris Benton for winning 3rd Place. Team Jim Corr and Giulia Gallo with help from Tim Christie (Palo Alto) for winning 4th Place. Team Ethan Bortman and Laile Giansetto with help from Bud Birkenseer (Palo Alto), for winning 6th Place. And an extra round of applause for the rest of the BLBC bowlers who competed today: Sarah Allday, Cathy Dinnean, John Hooper, Jerry Knott, Dave McMullen, Frankie Napoli (dual member from Rossmoor), Mo Shooer (dual member from San Francisco) and Erwin Vista. 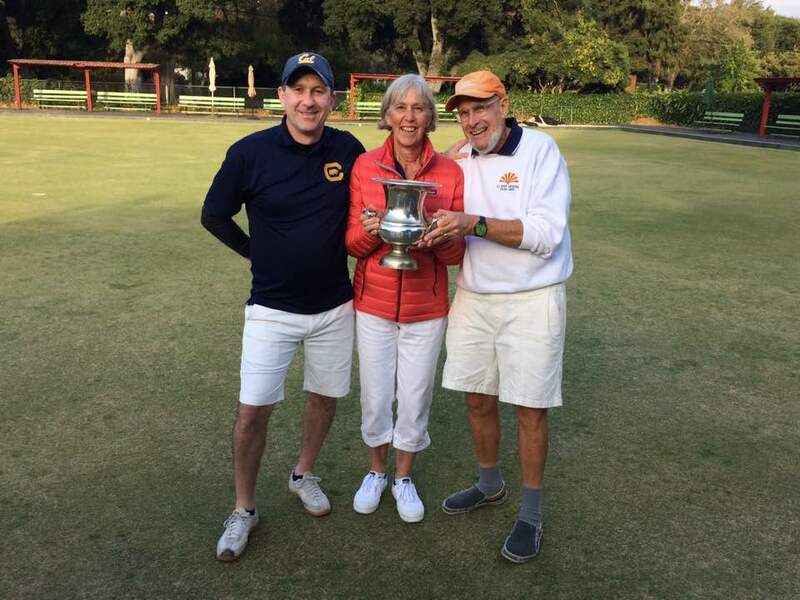 Rossmoor Lawn Bowling Club continues to celebrate its 50th Anniversary, this time at their 50th Anniversary Mixed Triples tournament, which saw twenty-eight teams from all over the Bay Area and beyond playing and celebrating the anniversary. 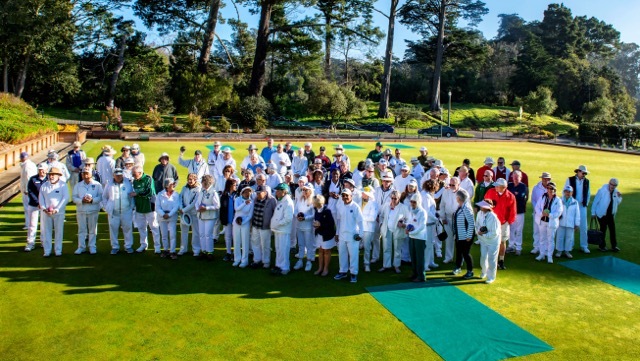 Berkeley Lawn Bowling Club was well represented. Three teams were comprised of all BLBC members; a fourth team had a dual member from our club. The format of the game was a 14-end game in the morning and another 14-end game after lunch, with the top five teams on both greens would win money in both games. Before each game began, bowlers on both greens enjoyed the always popular “spider”. (A bottle of wine for the bowler who ended up closest to the jack.) Also, prizes were given to the last team in both games who scored four or more points. Team Rob Hoey, Shawn Roney and Annie Brillhart tied for 1st place in the morning game with an Oakland team, and won 2nd place in the afternoon game. 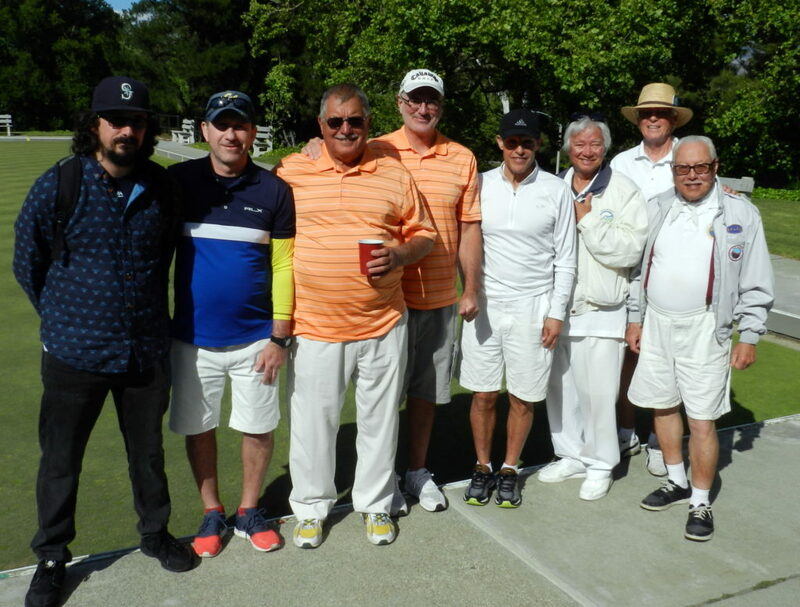 Dual member Frankie Napoli’s team won 4th place in the morning game, and team John Hooper, Cathy Dinnean and Cris Benton won 4th place in the afternoon game. 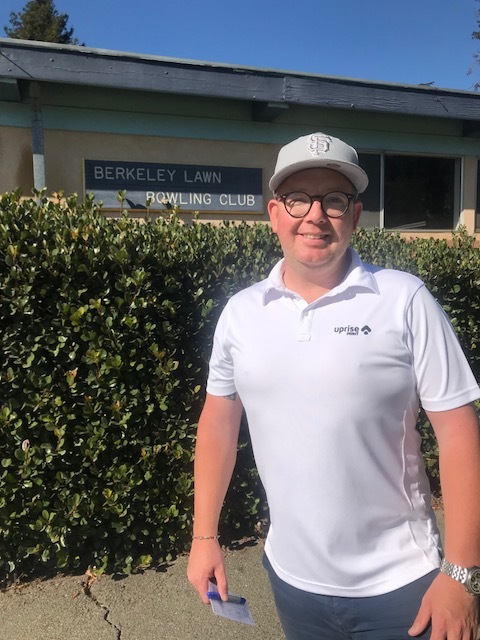 Twenty eight bowlers enjoyed a fun day of competition at the annual Berkeley Lawn Bowling Club Jamboree. 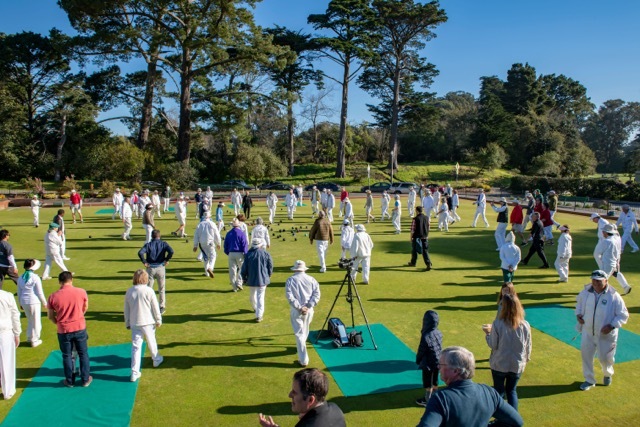 In this unique to Berkeley tournament, each player keeps her/his own score card and plays each game in the same position–but with different people (usually) in each game. It’s a great way to get to know other bowlers! We played three 12-end games. BLBC tournament director, Shawn Roney, set up four triples and one pairs game for each round. As always, prizes were awarded to the top 12 players. Five bowlers from Palo Alto competed this year. Congratulations to Ed Chang, a relatively new bowler, for placing 12th! Leisure Town bowlers love this tournament–probably because they always do so well. Eleven members from their club participated, and their own Andy Anderson won top honors! Four other bowlers from LTLBC also won money. 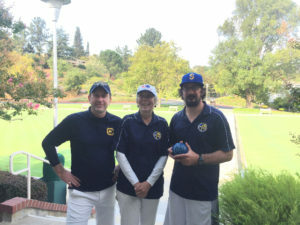 A very tough, but also a very fun day of bowling at Palo Alto in the PIMD Mixed 2×2 Fours. Eight teams played four 8-end games with a break for lunch after the second game. Only the top three teams would win money. The only two teams that won all three games had to play each other in the last game in a battle for first and second place. Congratulations to team Larry Collaco, Joanne Kluck and Angie & John Peet for winning 1st Place. A well deserved round of applause for team Rod & Rita Arriaga and Cheryl & Al Minvielle for winning 2nd Place. Congratulations to BLBC team Jerry Knott, Bob Schwartz, Annie Brillhart and Leslie Engler. Sixteen BLBC members bowled at Opening Day at Rossmoor LBC: Cathy, Giulia, Laile, Sarah, Susan, Bob, Cris, Des, Erwin, Gordon, Jim, Phil, Ray, Rob, Shawn and yours truly. Five BLBC members won money: Sarah, Cris, Phil, Rob and Shawn. Congratulations! On the lighter side: Giulia and Rob each won a flower and balloon centerpiece….one winner at each table. (Rob graciously gave his win to Ginger Harris. Nicely done!). 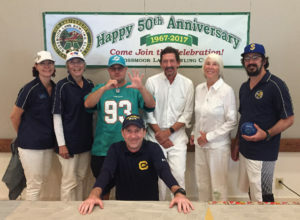 On top of that, everyone was given a pin celebrating Rossmoor LBC’s 50th Anniversary. The PIMD 2017 lawn bowling season has officially begun. Let’s hope our little club has another big year!